Services are scheduled for 9:30 a.m. Tuesday, Sept. 8, at Our Lady of Grace Catholic Church for Delfina Nunez Gutierrez of Artesia. 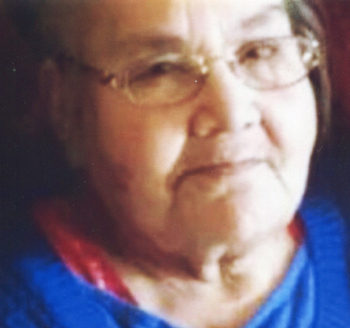 Gutierrez, 80, passed away Wednesday, Sept. 2, 2015, in the Artesia General Hospital emergency room. Fr. Martin Cornejo, OFM, will officiate at the services, with interment to follow at the Lake Arthur Cemetery. Pallbearers will be Lazaro Rodriguez, Raymond Ornelas, Juanito Aranda, Guillermo Comacho, Javier Aranda, Jose Rodriguez, Nick Ornelas, Jessie Gutierrez, Rigoberto Gutierrez, Manuel Aranda, Michael Barrios, Primotivo Rodriguez, Angel Rodriguez, Valentine Gutierrez, Juan Aguilera and David Aguilera. Visitation will begin at 2 p.m. Monday at Terpening & Son Mortuary. A rosary will be recited at 9 a.m. Tuesday at Our Lady of Grace. Gutierrez was born March 31, 1935, in Hereford, Texas, the daughter of Raymundo Nunez and Anita (Orosco) Nunez. On June 15, 1955, she married Calixtro Gutierrez in Loving, and the couple came to Artesia in 1958 from Loving. She was a homemaker and member of Our Lady of Grace Catholic Church and Our Lady of Guadalupe in Lake Arthur. She was a Guadalupana and loved to quilt. Survivors include daughters Irma Gutierrez of Artesia, Gloria Ornelas of Andrews, Texas, Guadalupe Camacho of Great Bend, Kans., and Lorenza Aguilera of Artesia; sons Pete Gutierrez of Roswell, Raul Gutierrez, Sammy Gutierrez and Joe Gutierrez, all of Artesia, Calixtro Gutierrez Jr. of Andrews, and Jessie Gutierrez of Artesia; sister Cindy Romero of Lake Arthur; 38 grandchildren; 105 great-grandchildren; and five great-great-grandchildren. She was preceded in death by her husband, Calixtro Gutierrez, on March 7, 1999; her parents; and a daughter.